We are here for you 24/7 to offer our experience, expertise and equipment so you can get back to normal living in your home after a fire. Using a professional restorer is valuable to homeowners because of their ability to neutralize odors rather than just masking them with household air fresheners. Minor property fires can still cause extensive odor issues. This problem is due to smoke traveling beyond the containment area, entering ventilation systems and depositing residues throughout the home. We train our technicians to trace smoke from the source and apply advanced odor control techniques to restore your home. Odor control services are essential for homeowners that have fire damage in Wayne. Even a small property fire can be a traumatic event, and the smells left behind are an unpleasant reminder. 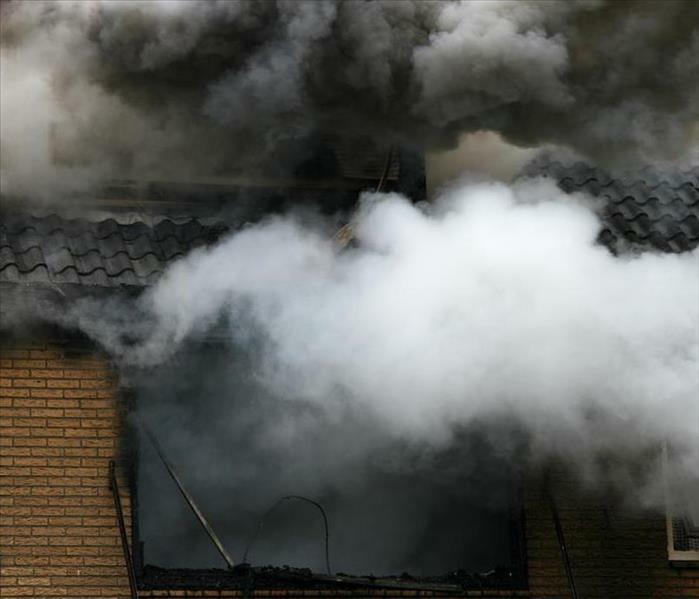 SERVPRO technicians understand how smoke migrates through a property which allows us to find and remediate the source. By tackling the problem at the source, we can be confident that odors do not return once the service is complete. As a general rule of thumb, odor mitigation is most effective when the deodorant is dispersed in a similar way to the odor. For fires, distribution of odors comes from two sources. The first is through smoke, which can travel on air currents leaving smelly deposits wherever it comes into contact with surfaces. The second is by soots dropping down and being absorbed by fabrics; an issue that can be exacerbated by moisture used in firefighting efforts. Furnishings and fabrics can often be expensive to replace. SERVPRO use solvent based deodorants that can be sprayed onto surfaces. These are more powerful air fresheners that cover the smell until the odor particles have dispersed enough to be no longer noticeable. We can combine this method with cleaning to ensure no soot and soiling is removed from surfaces. Once smoke enters a ventilation shaft, cavity or crawlspace it can quickly spread around the home. These are difficult issues to remediate since areas like this are hard to reach. SERVPRO can mobilize thermal foggers. These turn solvents into a vapor which is then distributed throughout the home. The solvents we use in thermal foggers are chemical pairing agents. They bond with odor particles neutralizing them or causing them to sink to the floor where they can be cleaned away after fire damage. Get rid of stubborn odors after property damage, contact SERVPRO of Wayne at (973) 546-4977. Click here to find a swimming facility in your area so you can enjoy those hot summer months approaching. After the flames are put out worry sets in on how to handle fire damage. We are available 24/7 to handle the disaster, call us right away. Managing fire damage restoration in Wayne requires a committed and highly-trained professional team and state of the art products and equipment. Since both the structure and the contents of your home suffer damage, partnering with a company that can accomplish a pack-out of portable articles is critical. We use a Contents Claim Inventory Service (CCIS) protocol to ensure a complete inventory and tracking of contents packed out. Once the affected areas in your home clear, we can more easily perform necessary remediation tasks. SERVPRO’s experienced production and crew managers and leads assess the damage, plan the remediation, and oversee the various stages of the project. Our service vehicles arrive stocked with water and fire remediation equipment, avoiding delays. Safety always comes first, so we secure the building, tarping and boarding up if necessary. Firefighting water residual removal and drying proceeds next. Evaluation of the type of soot and matching of appropriate products and tools guides our crew during clean up. Light, ashy debris vacuum or dry sponge away. Thick, sticky soot from slow smoldering fires needs cleaning with wetting agents, surfactants, and agitation. Protein-based soot might require solvents and abrasives. Charred areas might restore if the burned areas are shallow, but we always assess for strength to be sure your home retains its structural integrity. If necessary, we remove and replace materials, relying on the skills of our rebuilding crew. SERVPRO deodorization experts walk through a multi-step protocol to eliminate rather than cover up odors. Professional grade thermal foggers, ozone machines, and hydroxyl generators are available for tough odor issues. While our crews remediate and restore at your home, our production facility technicians use specialized strategies to clean and restore your packed-out furnishings and other contents. We facilitate their return to your home at the appropriate time. SERVPRO works closely with your insurance throughout, limiting your out of pocket expense for both structural and content restoration. SERVPRO of Wayne stands ready to restore your home and its contents after fire damage. Call us 24/7 at (973) 546-4977 to set up an assessment. Plan a visit to one of our swimming facilities this summer, click here for more information. As a leader in the restoration industry, SERVPRO® knows timely mitigation is the key to reducing severity and recovering damaged items. Water– or smoke–damaged paper can rapidly deteriorate. Without proper handling, valuable files and irreplaceable documents could be lost forever. Let SERVPRO’s Document Restoration Team help you recover your damaged paper goods before it is too late. SERVPRO’s technicians are trained to use the most advanced technology available for document recovery and drying; in fact, the Document Restoration Team uses the same technique the Library of Congress uses to dry water-damaged books. sublimation—turning a solid directly into a vapor, skipping the liquid stage to avoid causing more damage to the documents. This process can recover even the most delicate items—from documents to photographs and x-rays, to entire business archives. All employees of the Document Restoration Team are HIPAA Master certified and once your items arrive at the SERVPRO® facility, 24/7 video surveillance is guaranteed. With the new age of technology, digitizing records and documents has become a standard practice in most industries. This eliminates the need to have massive file storage rooms and allows us to access records at the click of a button. If your file room was damaged by water or smoke and needs to be cleaned, dried or decontaminated, digitizing might be a good choice to eliminate the need to have hundreds or even thousands of documents and records in storage. Gamma irradiation is a process used for cleaning/disinfecting and decontaminating documents or other consumer goods. In a CAT 3 situation (sewage or flood water), documents are not only deteriorating but are also infected with all types of bacteria. In most storm situations, you are dealing with CAT 3 water; therefore, most of the affected documents you encounter will be contaminated. If this is the case, decontamination is always a must. In living cells, these disruptions result in damage to the DNA and other cellular structures. These photon induced changes at the molecular level cause the death of the organism or render the organism incapable of reproduction. The gamma process does not create residuals or impart radioactivity in processed products. Unfortunately, many businesses and government agencies have to dispose of counterfeit, faulty, expired or contaminated materials. All entities need to be certified that their products and materials are destroyed. The guarantee of certified destruction is to protect one’s liabilities, brand image or proprietary information. We guarantee certified destruction to give you peace of mind that your documents are disposed of properly. Contact us at 973-546-4977 if you have a service need or click here to visit our website to learn more about SERVPRO of Wayne's System Services. Like Us on Facebook or Follow us on Twitter or Instagram and follow the tips, tricks and advice we share with our community. 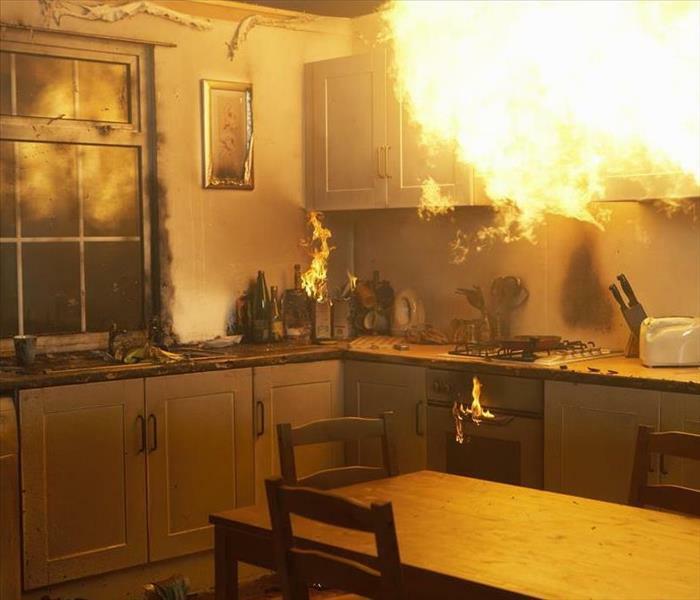 During a fire, innumerable toxic chemicals, poisonous gases, heavy metals, and other toxins are generated by the materials, household products, and vegetation that burns. These contaminants fill the air, become part of the ash, and are extremely dangerous to your health if inhaled or come in contact with your skin. We often forget about the dangers involved in the various environments we enter, but safety should always be a top priority. Have an environmental testing laboratory test for Volatile Organic Compounds (VOC’s) and particulates to determine what types and concentrations of toxins may be present. Although it seems as if our winters are longer and colder, the winter weather business protection tips described above can help give you piece of mind during the winter months. We believe that implementing these tips can greatly reduce a building’s potential structural loss and loss of business operations due to large snow falls, freezing temperatures and power outages during these times. Seal Exterior: Seal all cracks, holes, windows, doors and other openings on exterior walls with caulk or insulation to prevent cold air from penetrating wall cavities. Seal Interior: Insulate and seal attic penetrations such as partition walls, vents, plumbing stacks, and electrical and mechanical chases. Relieve Pipe Pressure: Let all faucets drip during extreme cold weather to prevent freezing of the water inside the pipe, and if freezing does occur, to relieve pressure buildup in the pipes between the ice blockage and the faucet. Keep the Building Warm: Install a monitoring system that provides notifications if the building's temperature dips below a pre-determined number. Insulate Vulnerable Pipes: Insulate pipes most vulnerable to freezing by using pipe insulation. Install Early Detection System: Install an automatic excess flow switch on the main incoming water line to monitor and provide early detection of a broken pipe or valve. Use wireless sensors near water sources. Monitor Fire Protection Sprinkler Systems: Monitor sprinkler systems using a central station to provide early detection of a pipe failure and heat unheated sprinkler control rooms. Install Backup Power: Provide a reliable backup power source to ensure heat to the building. Frozen pipes are one of the leading sources of property damage when the temperature drops. Don’t let damage from frozen pipes soak your home or business—prepare using the following guidance. Install an automatic excess flow switch on the main incoming domestic water line to monitor and provide early detection of a broken pipe or valve. Use wireless sensors near water sources. When it comes to the weight of snow, the type of snow is as important as the depth of snow. Fresh “powder” type snow is typically lighter than wet packed snow. Ice is heavier than snow. During the winter months, a roof system can be exposed to all three combinations over a several month period. Fresh snow: 10-12 inches of new snow is equal to one inch of water, or about 5 lbs per square foot of roof space. Packed snow generally is heavier than new snow: 3-5 inches of old snow is equal to one inch of water, again about 5 lbs per square foot of roof space. Ice is also heavier than snow. One inch equals about a foot of fresh snow. The total amount of accumulated snow and ice is what matters in evaluating snow load risk. For example, the accumulated weight of two feet of old snow and two feet of new snow could be as high as 60 lbs per square foot of roof space, which may stress the limits of even the best designed roof. If you are in the “danger zone” according to chart above or if the loads you estimate based on the thickness of the various types of snow and ice exceed 20-25 psf, you should consider having the snow removed from your roof. Factors that could dictate how your particular facility will perform under the weight of ice and snow. These factors are listed below, which includes engineering considerations that could help you avoid roof collapses this winter. If it is determined that the roof system is not adequately designed to withstand the snow falls being encountered, a building owner should consider strengthening the roof as soon as possible or before the next winter. A structural engineer can determine the maximum loads your roof can withstand, as well as provide practical solutions to improve the strength of your roof. Safe snow removal may reduce some of the snow load on your roof. Consider contracting with a professional for snow removal. If your workers will be removing snow keep the guidelines below in mind. To avoid roof collapse, snow removal should begin prior to reaching the snow load limit of the roof. Always follow Occupational Safety and Health Association (OSHA) Regulations and Standards, particularly fall protections for roof work. Avoid using shovels or snow blowers. Instead, use a heavy duty push broom with stiff bristles or roof rake to brush off the snow down the slope of the roof. For most single-story buildings with steep sloped roofs, a roof rake may be used for while remaining on the ground to pull snow down the roof slope. Do not pull snow back against the slope or sideways since the snow may get underneath the cover and can break shingles. We do not recommend chipping or breaking ice dams because this can damage the roof. The following guidance is for the most common types of commercial roof systems. New roof installation: Seal the roof deck using at least two layers of underlayment cemented together or a self-adhering polymer modified bitumen sheet. Extend the moisture barrier at least 24 inches from the edge of the eaves to beyond the inside of the exterior wall. Among the biggest weather events of the winter are the recurring monster snowstorms that wallop the Northeast and wreak havoc on travel throughout the U.S. during a 6-week period from late January to early March. Frequent snowfalls are accompanied by persistent cold temperatures that prevent melting. When it is all done businesses throughout the region experience roof collapses, frozen pipes, and the logistical challenge of getting employees to work when neither roads nor transit systems can keep pace with the snow. While these “snowpocalypse” storms receive the most attention, winter cold and storms pound many parts of the U.S. during the past year; the lessons learned from these heavy storms can help businesses elsewhere prepare for and respond to snow, ice, and freezing temperatures in 2018 and beyond. With this goal in mind, following is guidance on severe winter weather and business protection. Winter storms launch a “blizzard” of social media, as people across the Northeast post photos, videos, and personal anecdotes about the snow. While many of these posts help inject humor into a difficult and sometimes dangerous weather event, they also helped strangers isolated by the storm come together and commiserate. At least as important, social media serves as a way for emergency management officials to warn residents about approaching weather conditions (including how to prepare and what to do during and after a storm), and some businesses use it to stay connected with employees, customers and business partners. This allows them to communicate quickly, widely and accurately—providing such information as the opening status of the business, whether employees need to report to work, any delays in the provision of goods and services, and when updated operational information would be available. Importantly, while these same social media tools that employees use in their personal lives can be applied to post-disaster business communications at little or no cost, planning ahead is essential to finding the specific social media platforms that will work best. Due to the rapid and heavy snow accumulation last winter in the Northeast, a number of states and localities issued widespread travel bans. Even after the bans were lifted, many roads remained impassable, and Boston’s public transit system was incapable of transporting its usual 1.2 million daily riders. For many employers, telecommuting became a vital option that allowed them to avoid a shutdown while keeping employees off of clogged or dangerous roads and stalled mass transit systems. However, for telework to be successful, employers need to plan ahead by identifying telecommuting strategies, documenting a telecommuting policy, putting in place an I/T structure to support the program, and testing the system prior to a blizzard or other emergency. Snow and ice have the potential to weigh down tree limbs and pull down power lines, causing widespread and long-lasting power outages. Although power outages associated with winter storms are not as severe as anticipated (due to the powdery light snow that falls in most areas), that is not always the case. In fact, one of the worst storms in this regard was the unprecedented 2011 Halloween nor’easter which hit when many trees were still in leaf, resulting in tree and branch collapses that caused an estimated 3.2 million commercial and residential power outages, some lasting long after the snow had been removed or melted. A commercial generator can help businesses minimize disruption when faced with such a situation, but only if one is purchased, installed, and maintained prior to the time of need. It is also critical to have effective generator safety practices in place to minimize risks to people and property, including fire, damage to electrical equipment, and, most tragically, carbon monoxide poisoning. It is also important to have contracts in place with reliable vendors to ensure delivery of generator fuel and other critical supplies. After snowfall, it is important to clear parking lots, driveways and sidewalks to provide safe access for employees, customers and suppliers. In some jurisdictions, there are legal requirements for snow removal; but even if that is not the case, promptly removing snow and minimizing icy surfaces is important for reducing the likelihood of slips and falls, and shows customers you are open for business. Smaller snow amounts can be handled by maintenance staff (assuming the right snow removal equipment is on hand), but large accumulations generally require professional snow removal contractors. These crews are in heavy demand after a storm, so it is critical to have outside service contracts in place prior to the first snowfall of the season. When selecting a contractor, it is important to make sure the people who remove your snow/ice will show up as anticipated, do a thorough job, and work within previously negotiated price guidelines. Make sure the contract covers all of your needs (e.g., parking lots, driveways, walkways, roofs). Look for an established, licensed and bonded professional. Ask to see the contractor’s certificates of insurance. Make sure coverage for liability and workers’ compensation insurance is current. Beyond the big headline blizzards, severe winter weather can occur in many parts of the U.S. from late fall until early spring. By the time these storms are broadcast by local forecasters, it may be too late to put in place the measures needed to remove heavy snow and ice, protect roof systems and water pipes, and keep employees and operations productive. With advance planning, businesses can minimize “snowpocalypse” disruption as they wait for warmer weather to arrive. For many small businesses, the holiday/ winter weather season is when they will earn a significant part of their revenue for the entire year. For others, it is a time when they will close for a short break or long winter hiatus. Regardless of your business model, preparing for the holidays and winter season can help prevent problems caused by indoor hazards or winter weather. Choose decorations wisely. Some may be combustible and should be kept away from any heat or ignition sources. Use battery-operated candles in place of traditional ones. Do not place extension cords in high-traffic areas of your workplace, or under rugs, carpets or furniture. Promote safe ladder use. This can help protect both employees and customers. Inform customers in advance if you’ll be closing for the holidays or a longer seasonal break. Update your company website to reflect closing details. Shut down any unnecessary office equipment. Secure your building and set alarms. Advise your security company that you will be vacating the property. Verify/update emergency contact information they have on file. Consider hiring a patrol service to conduct recorded rounds while inspecting the premises at different times of day and night to reduce the threat of vandalism and theft. Thermostats should be maintained at a minimum of 55°F when the building is unoccupied. For early detection of a broken pipe or valve, consider installing a monitored electric leak detection system for the main domestic water line. Monitored electronic sensors can also be installed near water sources for early leak detection. Run a small trickle of water to keep pipes from freezing. Open cabinet and utility room doors to expose pipes to warmer room temperatures to help keep them from freezing. Ensure all pipes located in vulnerable areas, such as crawlspaces, exterior walls, attics and unheated basements, are insulated with sleeves or wrapping. The more insulation you have, the better. Hardware and big box stores usually carry foam or fiberglass insulation. UL-approved gas or electric unit heaters can be installed in unheated sprinkler control valve/fire pump rooms. Indoor and outdoor fire protection sprinkler systems should be monitored by a constantly attended central station to provide early detection of a sprinkler pipe rupture due to freezing. At minimum, if your business is not located close to where you live or are spending the winter, have someone check the property to ensure the heat is working and the pipes have not frozen. If the building will be unoccupied for a prolonged period, safely clear the roof of all debris, dirt and leaves, which can block gutters and downspouts. Debris buildup can prevent snow melt from properly draining away from the building and can cause ice dams and heavy snow buildup on your roof. Inspect gutters/downspouts for securement. Heavy snow/ ice can cause gutters to weaken and sag, leading them to break away from the building and allow for water intrusion. If a winter storm occurs during a holiday or seasonal break, arrange for snow removal for employee access and plan to have a professional remove any excess snow from the roof. This will prevent excessive loads on the roof which could cause structural failure. The winter holidays should be a time for businesses to reflect on past challenges and accomplishments, and make plans to prosper in the New Year. But at the same time, it is important to take steps to prevent injury or damage that can be caused by risks that are unique to this season. Doing so now can provide a head start on New Year’s resolutions to strengthen your business in 2019. Single-wall stove pipe, unless approved by local codes and the installation manual.